In past issues of Muscle Insider, we’ve talked about how to build your brand and how to find your niche audience. Assuming you’ve followed the advice, it’s safe to say we can start teaching you what not to do as well. What follows is a short but effective list of things to avoid doing in order to keep your growth on Instagram consistent and your followers happy and engaged. If you’re trying to build your brand, you need to be consistent. The tone, style, and cohesiveness of your account will be what attracts (and keeps) your followers. 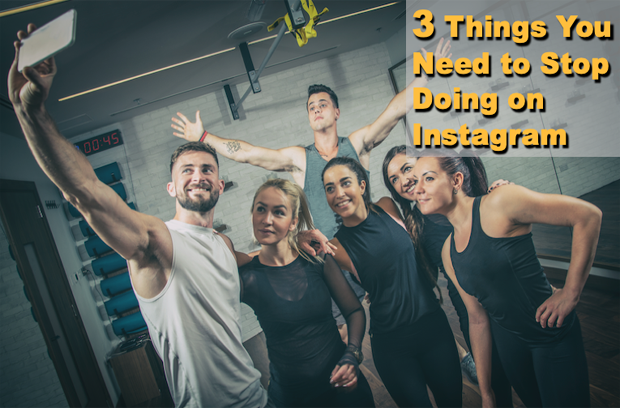 If you want to be known as the king or queen of all things fitness, then stop posting pictures of yourself with your significant other (unless you’re at the gym), or yourself with your mom on her birthday (unless you’re having her party at the gym). When people look at your account as a whole, they need to see consistency. If you only ever post gym memes, great! Cool! Funny! Stick with that. Let that be your thing. According to social media expert Rachel Krantz from bustle.com, “You don’t need to be living a perfectly curated life to be successful on Instagram, but it is good to have an authentic personal style that runs through your posts.” So stop switching from the gym to the club to grandma’s house; just own the fact that you’re “the Fitness Guy,” and make it work for you. This is where you might want to consider spending a little money, but think of it more as an investment in your online future. Right now, you’re taking selfies in your bathroom, the gym’s locker room, or that Lululemon fitting room with the epic lighting. Yawn. What about taking photos of your training outside? Or on the gym floor? Or at an outside gym? Either way, I suggest you pay a professional photographer, or even give a friend with a decent camera a couple of bucks, and have some quality photos taken from various locations and in different outfits. You cannot and should not rely on the same angles and lighting all the time. Your fans are going to get bored. We definitely try to respond to everyone on MUSCLE INSIDER’s accounts (@muscleinsider and @muscleinsidercanada). People like to feel liked. Individuals are taking time out of their day to comment on your photos or send you messages, letting you know the impact you’ve had on their life. You’re not too busy to ignore the love and praise coming to you (unless you’re already an InstaFamous fitness model; in which case, why aren’t you the one writing this column?). These individuals have similar views to your own (otherwise they wouldn’t be following and interacting with you), so opening up dialogue might even help your business and/or popularity. Who knows what kind of influencers they might be or have in their sphere? These are just a few of the many tips out there for things to avoid doing on your personal or business page in order to grow your popularity.